July 17, 2009: Forty years ago, Apollo astronauts set out on a daring adventure to explore the Moon. They ended up discovering their own planet. Apollo 8 was the first crewed Saturn V launch and the first time humans were placed in lunar orbit. Mission plans called for the astronauts to photograph possible landing sites for future missions. Before this, only robotic probes had taken images of the Moon's far side. As the astronauts in their spacecraft emerged from behind the Moon, they were surprised and enchanted by an amazing view of Earth rising over the lunar horizon. 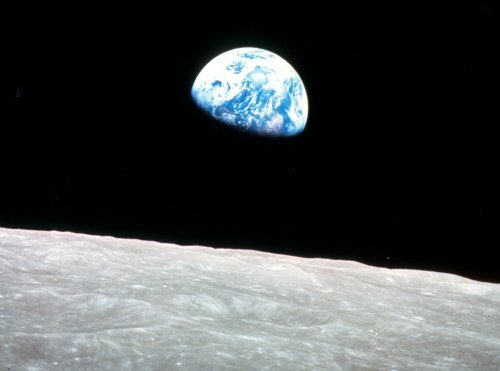 Bill Anders quickly snapped a picture of the spectacular Earthrise – it was not in the mission script. His timing could not have been better. It was Christmas Eve, 1968, the close of one of the most turbulent, fractured years in U.S. and world history. The picture offered a much needed new perspective on "home." 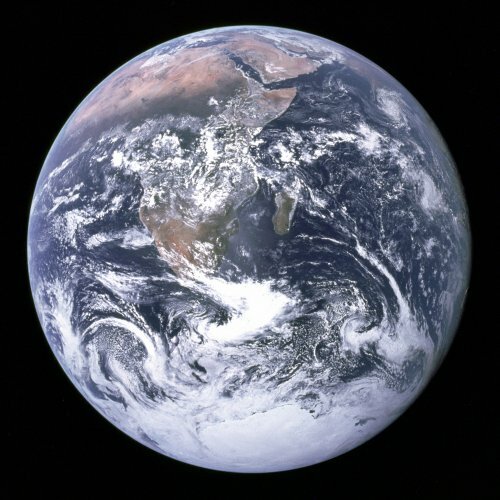 For the first time in history, humankind looked at Earth and saw not a jigsaw puzzle of states and countries on an uninspiring flat map – but rather a whole planet uninterrupted by boundaries, a fragile sphere of dazzling beauty floating alone in a dangerous void. There was a home worthy of careful stewardship. The late nature photographer Galen Rowell described this photo as "the most influential environmental photograph ever taken." "It changed humanity's entire orientation," says Kristen Erickson of NASA headquarters in Washington, DC. "And similar photos taken by the Apollo 11 through 17 crews reinforced the impact of this first view." Apollo photos of the big blue marble energized grass-roots green movements and led directly to the modern fleet of Earth observing satellites NASA uses to monitor and predict weather, examine ozone holes, investigate climate change, and much more.1 Like Anders' camera, these satellites have transformed the way we view the planet we call Earth. We gained all this by shooting for the Moon. The Apollo astronauts were, by their own admissions, profoundly moved and changed when they gazed upon Earth from their unique position in space. "It changed my life,"2 said Rusty Schweickart, Apollo 9 astronaut. Apollo 17 was the last crewed Moon mission. Since then, no humans have been to the place where they can float and gaze at the whole Earth. The crew of the International Space Station has a beautiful view of Earth, but not the whole Earth. Because the space station is in low-Earth orbit, only a portion of the planet can be seen at any one time. For the big picture view, the Moon can't be beat. Soon, we'll be back. Right now, the Lunar Reconnaissance Orbiter is circling the Moon gathering critical data NASA scientists need to plan for renewed human exploration. NASA is once again charting a daring mission to the Moon -- this time to stay. In his recent confirmation hearing to take NASA's helm as administrator, former astronaut Charles F. Bolden Jr. said, "I dream of a day when any American can launch into space and see the magnificence and grandeur of our home planet." Until then, a few astronauts will take the ride for all of us, and they'll be carrying cameras a thousand times more advanced than Apollo. What the space agency shows us will surely expand our vision. It always has. 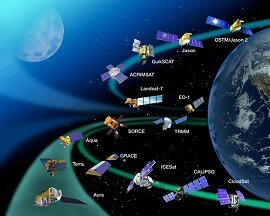 (1) The new ecology awareness the whole Earth view engendered in the nation, with the resulting advances in Earth science, was just one aspect of the technology surge that originated with the Apollo Program. In fact, every scientific and technological discipline was advanced during Apollo. (2) Schweickart's quote is taken from The overview effect: space exploration and human evolution, by Frank White, 1987, p. 200. (3) Cernan's quote is taken from White's book, p. 207. (4) Allen's quote is taken from White's book, p.235.